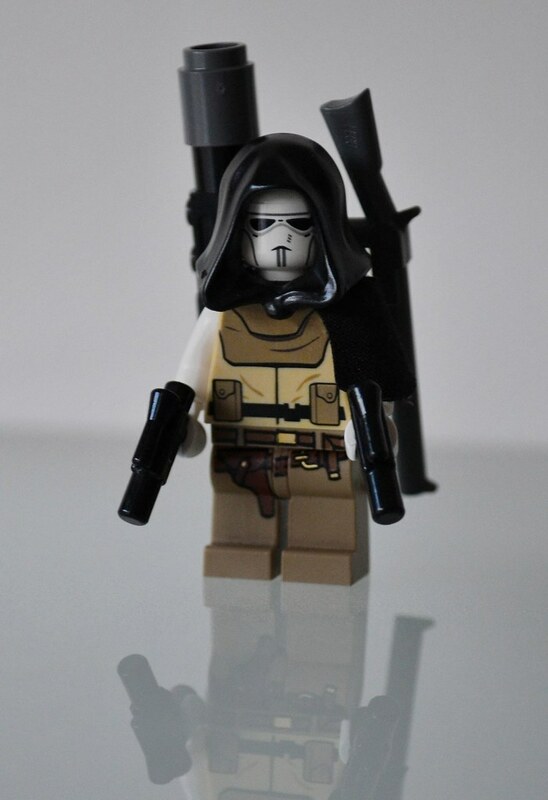 Hi everybody, here is my Bounty hunter for the MOC Madness 2011, i ve got to say this is my first MOC ever so lets see how it goes. Personally, this has been a very fun contest and I'm sure it has been for all. But tends to get very stressful the last few days. Here is my humble entry. 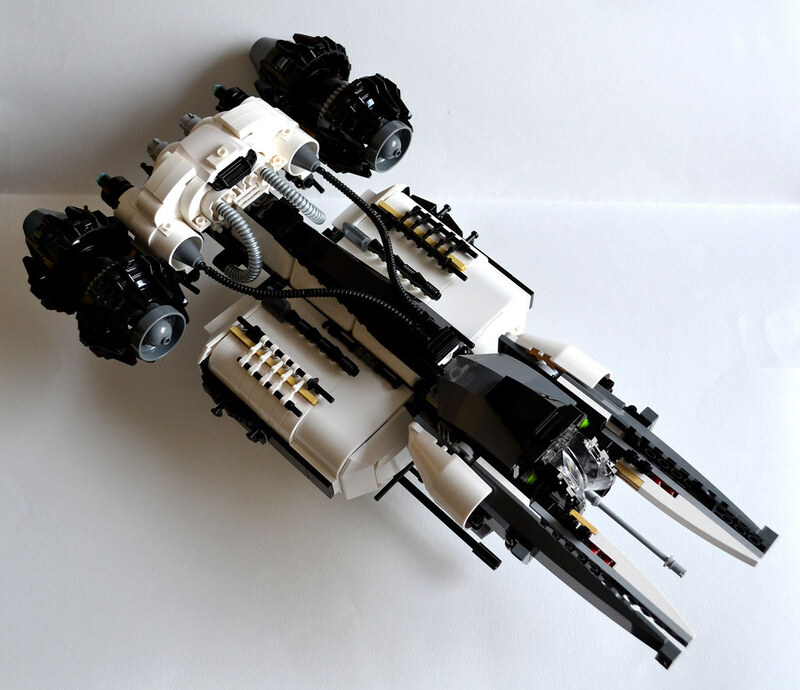 The most feared bounty hunter ship in the galaxy. 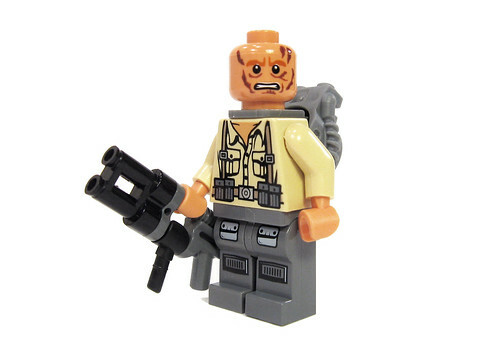 Ruusk is the closest humans can come to properly pronouncing this bounty hunter's name. His ship, Kel A2, is all about misdirection. 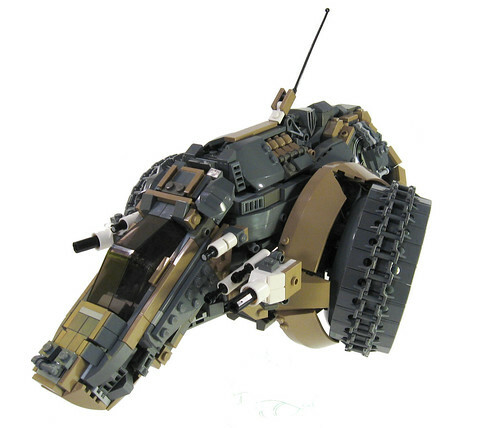 The nose has twin heavy laser cannons. Should it be damaged, the nose can be ejected and left behind (filled with explosives) as a mine. Ejecting the nose exposes another pair of heavy laser cannons and allows the Kel A2 to play "possum," draw in an enemy, and attack. 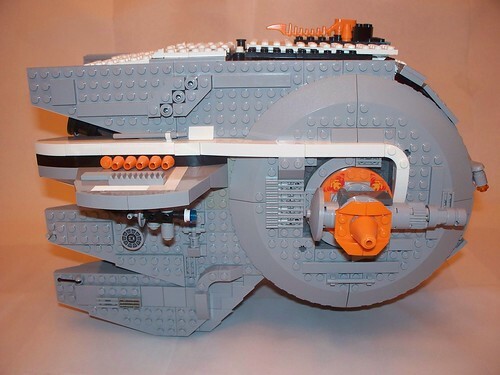 Kel A2 armaments also include two wing-mounted ion cannons, four wing-mounted hyperdrive-seeking concussion missiles, four belly-mounted laser cannons, and two aft-mounted sonic mines. Ruusk pilots the Kel A2 from inside a shuttle on top of the main ship. 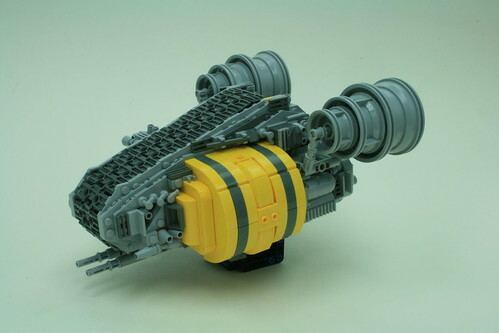 The shuttle can separate from the Kel A2 and has a pair of wing-mounted laser cannons. 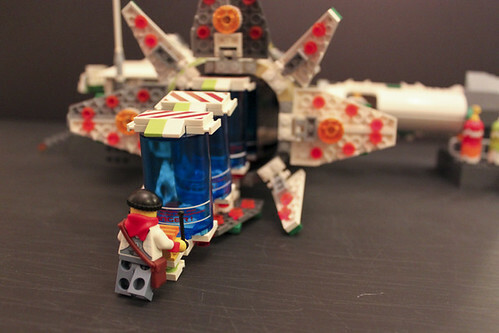 Under the shuttle's canopy hides a blaster rifle. Behind the pilot seat are a pair of Ruusk's blasters. 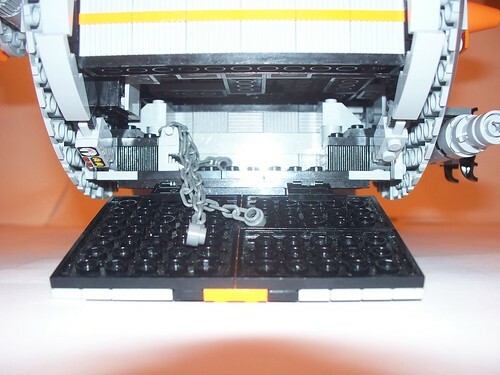 Attached to the top of the port wing, hidden in plain site, is a Hunter Droid. 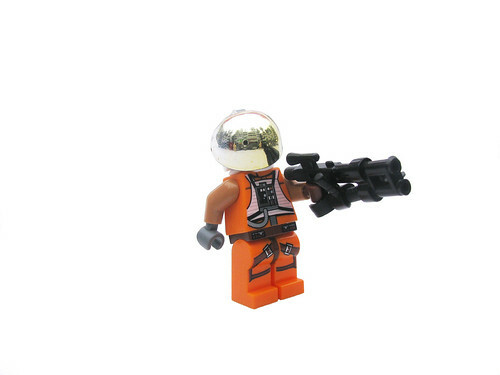 The Hunter Droid is used to flush out or pin down bounties and is equipped with a pair of compact, hand-held blasters as well as an attack jet pack that includes a laser cannon and grenade launcher. 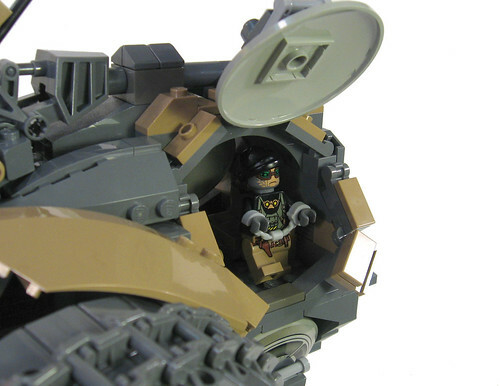 The prisoner hold is concealed inside the body of the Kel A2. 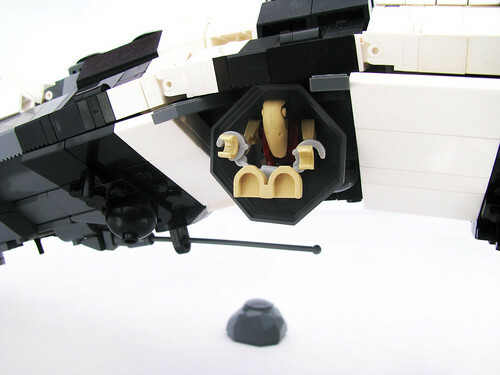 Once the landing gear (seemingly a rare feature any more) is extended, the prisoner hold extends out from the belly of the ship, rotates to the aft, and becomes part of the landing gear. 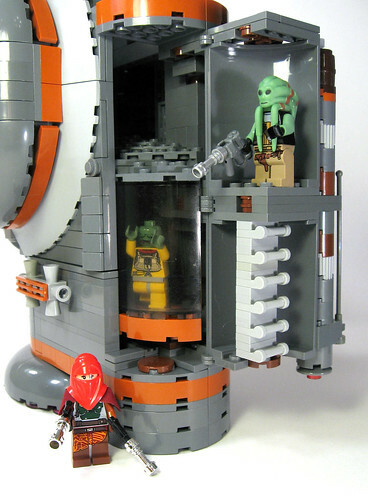 The prisoner hold has a canopy that allows the bounty to be safely inspected before changing custody. 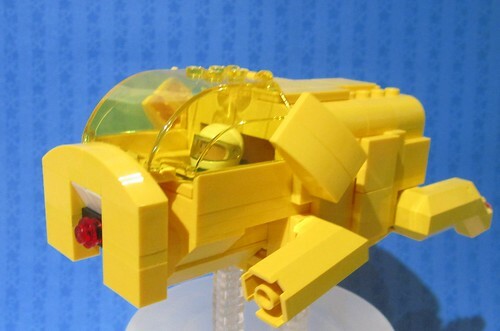 On a personal note, there are some tremendous builds submitted. Kudos! Last edited by dmetcalf on Mon Oct 31, 2011 8:21 pm, edited 7 times in total. 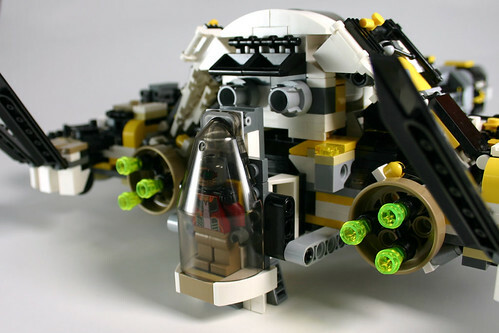 Bounty hunter Tao Illwind bought The Spectrum from a sports team owner on some backwater planet. (The ship's accent colors matched the team's colors, according to the owner. And strangely enough, the sport was played on ice with wooden sticks.) Anyway, blah blah blah, the ship has laser guns, armor, big engines, and a nice little place that Tao can put his bounties. Tao flies The Spectrum with the help of Smedley, his little monkey. Two hours and ...fifty four minutes remaining! Long time viewer, first time poster. There are a lot of amazing entries. Good job everyone! Here's my entry hope you enjoy them as much as I have enjoyed everyone else's creations. 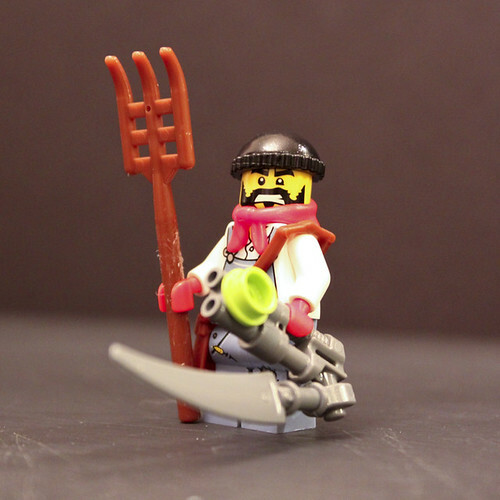 Being driven out of business because companies created and patented genetically modified seeds, an average farmer, Harvey Ester, had to find a new line of work or struggle in these hard times. These greedy companies took advantage of having a monopoly over produce and destroyed crops if a hefty fee was not paid. Already living a life of meager wages this was leading Harvey to his breaking point. Years go by and millions of people start having severe abnormalities to the point where another of race was created to categorize them. Testing shows that the seed corporations are responsible. One-by-one these corporations are questioned for human endangerment based on side-effects related to the genetically modified seeds. Redemption day has finally come. These corporations will be taken to justice and pay for their crimes. Harvey could finally get his life back together. Unfortunately, the most of heads of these corporations flee to avoid being held accountable for their unscientific process and lack of testing of the produce. The ones that don't flee plead the 5th. How nice. Will justice ever prevail? Just when things couldn't get worse, a malfunctioning B-wing starfighter crash-lands on Harvey's home and kills his family. Having lost everything and giving up on the legal process. Harvey decides to take matters in his own hands. 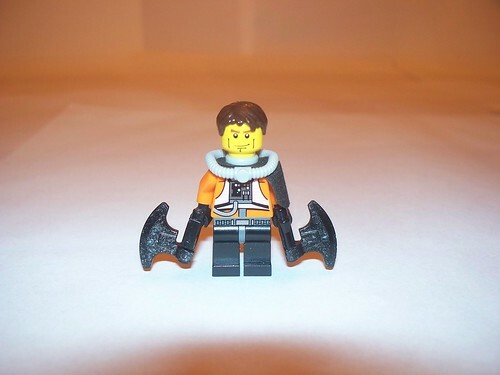 Using mechanical and structural pieces around his farm and abandoned neighboring farms Harvey outfits the crash-landed B-wing and creates his own bounty hunter ship, Scarecrow. Harvey starts his mission to collect the bounty on the corporate scum and is eventually know throughout the galaxy as the HarvEster. 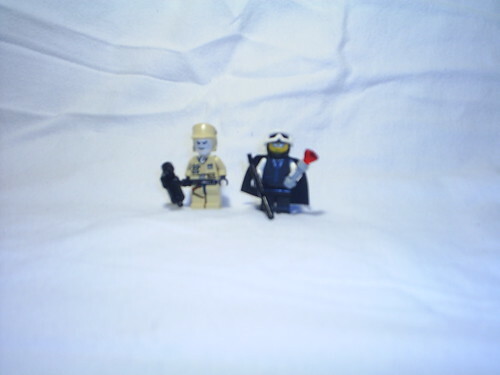 Check out my flickr account for more detailed images. Good luck everyone. Col. Hague and The Guppy. Col. Hague. 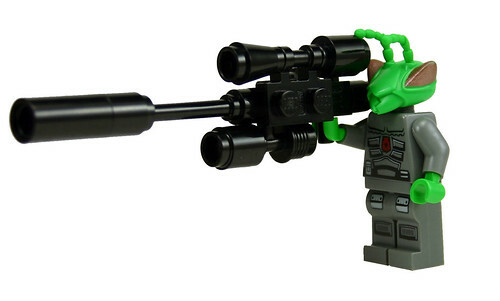 After 35 years as Galactic Space Police colonel, Col Hague retired and decided to take up bounty hunting. The Guppy. A Col. Hague original flying machine. A jumbled together pile of rusting metal, a discarded escape pod and a former Emperal detention cell. 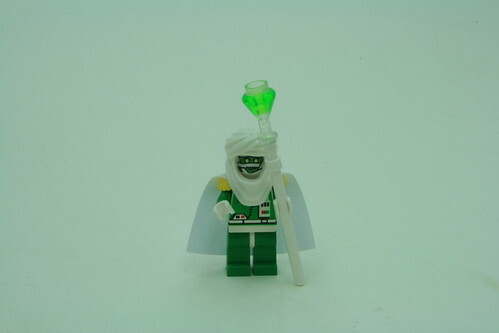 Although he is a bounty hunter, F’nn’s reward is neither credits nor fame, but the knowledge that the light side of the Force has triumphed over the dark (and perhaps a kiss from the ruler of the Kandee people, Princess Bblgum). 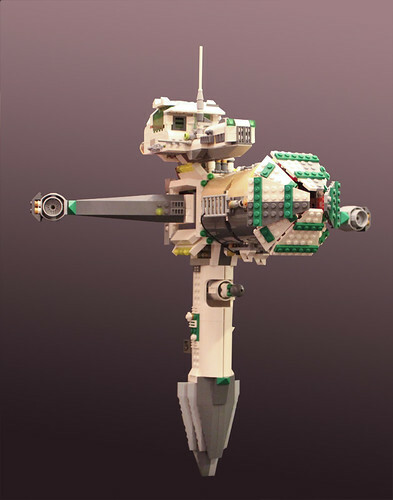 Click through to Flickr to see more, including F'nn's droid, B3-MO. 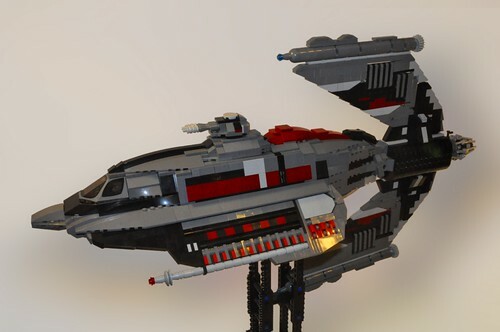 Here is my VERY last minute entry, and my first ever serious MOC! A bounty hunter of unknown bipedal species, Shallac Nexi has a nasty reputation in the Deep Core worlds. While it appears that the bounty hunter requires some respiratory assistance via hoses to his mouth, his nostril slits and eyes are left exposed to the air and it is assumed that oxygen is not toxic to his system. 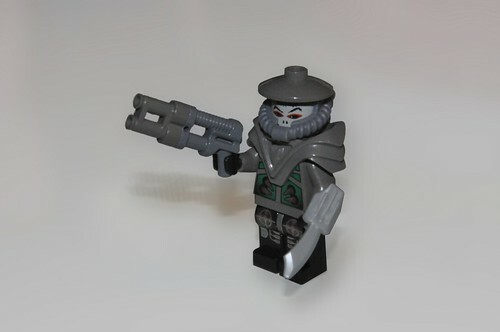 He has been observed using a wide variety of weaponry, most often a modified Retribution blaster carbine and a pair of wrist mounted retractable vibro-daggers. In addition to the cortosis weave blades, his gauntlets housed a number of other surprises for his prey, including poison darts and nonlethal monofilament netting. 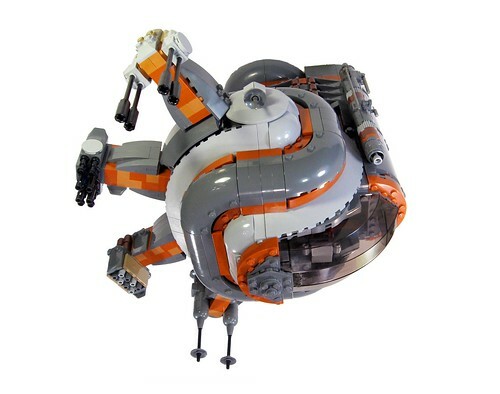 Nexi is accompanied by a pair of droids, a grey biped of unknown make that actively assists with the hunt and a black R9 astromech for ship repairs and navigational assistance. 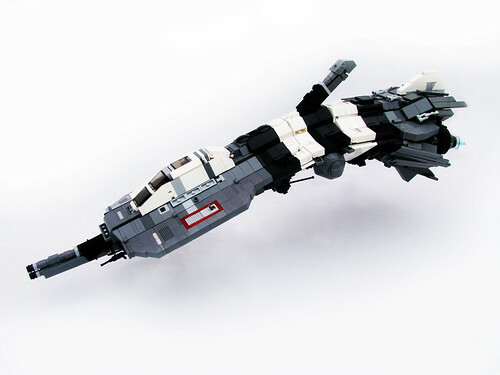 His ship, the Rusty Dagger, is a unique powerhouse hidden beneath an extremely common (and by his time, antiquated) starship hull. Much of the ship's color has worn away over the ages, exposing the dull and scored durasteel, though smatterings of its prior red and black paint job still show. 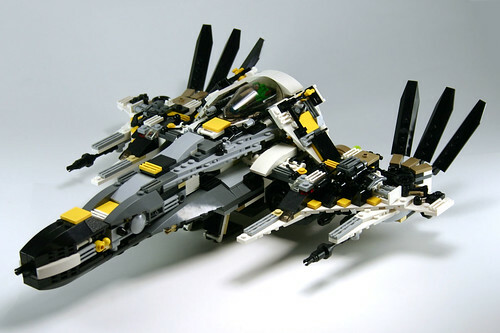 Having crashed his previous vessel on Raxus Prime while pursuing a bounty, Nexi constructed the ship using the forgotten parts on the junk planet. Taking the hull of a discarded Sienar Fleet Systems GAT-12 Skipray Blastboat, he fitted it with an engine, heavy shielding, and weaponry utilizing advanced technology that had been lost in the planet's waste for millennia. 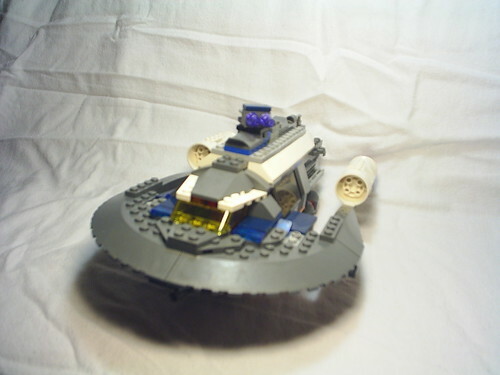 A Class 0.8 hyperdrive meant few could outrun this deceptively ordinary looking ship. 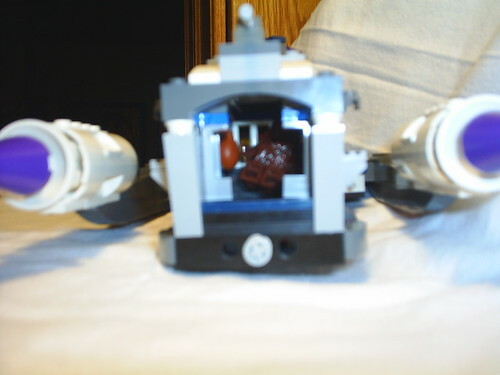 The vessel is outfitted with 2 forward facing laser cannons, a heavy twin laser turret, and a concussion missile launcher and a proton torpedo tube. 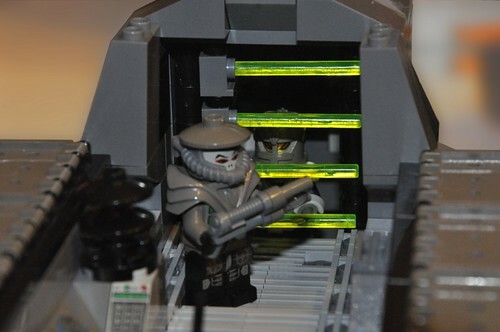 Three medium ion cannons and a tractor beam projector provide an ideal system for capturing his bounties without harming the occupants. 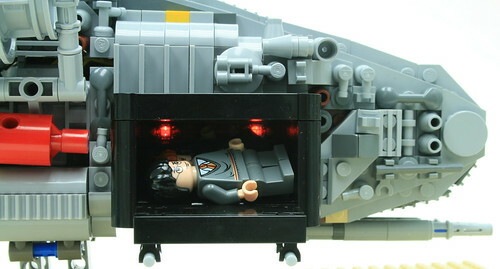 The prisoner compartment is located at the rear of the cabin, with paralysis-inducing electron beams preventing escape. These beams can be deactivated from the gunner's control panel or through a remote located in Nexi's gauntlet. This is my ship "Angry Perch" with Bounty hunter "Double Blood"
So close to the end! Don't push your luck people! 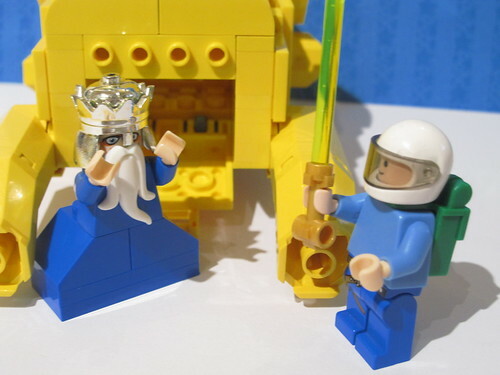 Babi Slymn of Alderaan and his assitant Samm Wesell a Clawdite (changeling) from Zolan. Their ship is called the USP1. Babi once was a Sith apprentice to Darth maul, but after Darth Maul developed seperation anxiety, turned to more profitable endevours. 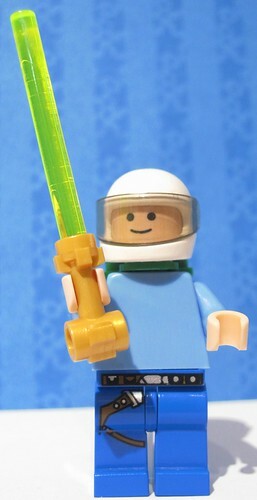 He is fond of using the ancient Sith "Light mace". The prisoner compartment of the USP1 features a drop floor should any prisoners needing to be jettisoned. Small, light, and fast, the USP1 is excellent at hiding and blending into the surroundings of most planets. Raesha Ka-Lia and the Soul Snatcher. Raesha arms the Soul Snatcher with the best weapons from her victims vessels. She offers her sedated bounties to the highest bidder. Her co-pilot Mafel Gorba is her merciless young pupil. Byron Madsen	and the Byblos K-110 "Red Slave"
Everyone please take a look at the entries above and PM me if I made a mistake with the names or photo links or anything like that. The four regional polls will be up tomorrow night. 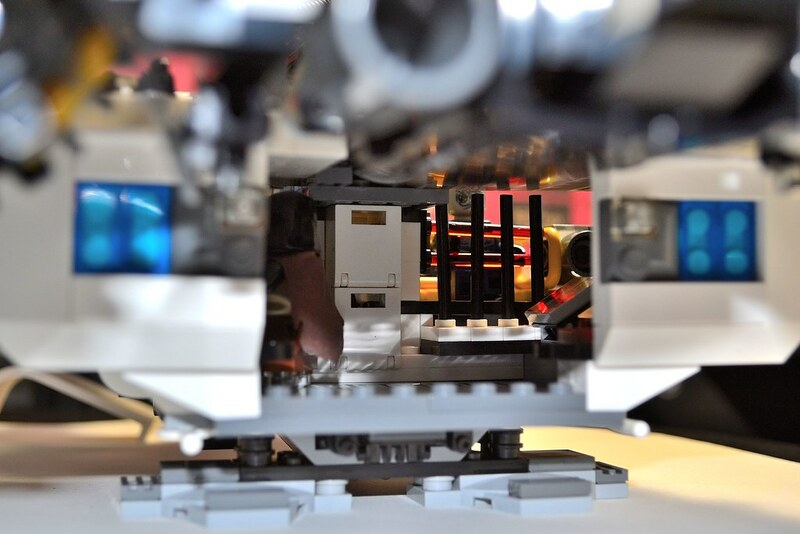 viewtopic.php?t=6272&p=61710#p61708 DQ'd unless he can verify the hull parts as official unmodified Lego elements.